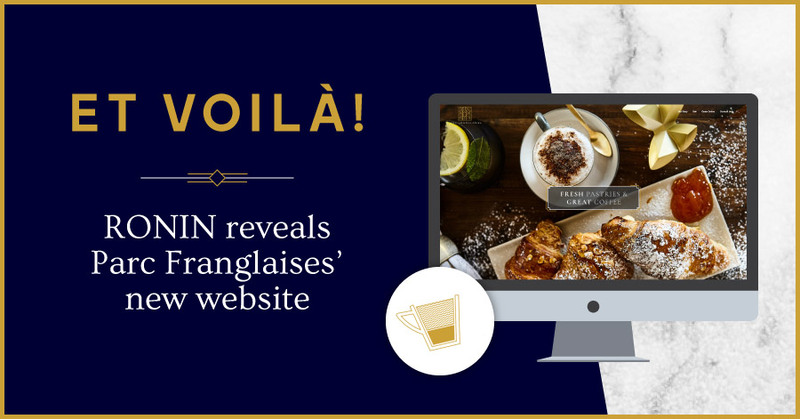 We’re delighted to announce the launch of a brand-new website for Parc Franglaises, a local artisan delicatessen and coffee house located in the heart of Beckenham. The deli is no stranger to a new look; in the last 18 months, the new owners rejuvenated a much-loved-but-tired local eatery from dated to decadent, introducing an understated Art Deco aesthetic. As part of their modernisation programme, the owners wanted to propel Parc Franglaises into the 21st century, and commissioned RONIN to create a state-of-the-art website – a first for the Beckenham deli. Opting for a personalised WordPress website, RONIN have created a fully-responsive, mobile-friendly site with easy-to-navigate functionality. Reflecting the deli’s existing Art Deco branding, RONIN’s designers have incorporated subtle nods to the era, whilst maintaining a contemporary feel for a stress-free user experience. Using Parc Franglaises’ colour palette of navy, gold and grey, we’ve ensured consistency across its branding, strengthening its new, modern look. And, with specially commissioned food photography showcasing the deli’s delectable delights, the result is a visually stunning website which truly is the crème-de-la-crème! To visit the Parc Franglaises website, click here. If you’d like to see some of our other website projects, you can view our work here. Do you think the website has that ‘je ne sais quoi’? Let us know on social media – find us on Facebook, Twitter, Google+, LinkedIn and Instagram.